I started making cards about 6 months ago! THANK YOU CHRISTINA for all of your inspiration on this site, and all the tutorials, that have helped me so much! This card took me about 30 minutes MAYBE. It is super easy. I make a lot of "thinking of you" cards for the elderly, and for friends. I have found that the simple ones go through the mail MUCH easier than some of the other cards I make. This is an A2 card. I embossed the right edge with a flower border, then lightly sanded it so the white would show through the embossing. The butterfly is cutout on a gold shimmer cardstock, with the top layer cut out from a patterned print and attached with small foam dots. The label is inked around the edges and "Thinking of you" stamped in clear embossing ink and heat embossed with gold tinsel powder. Giving some sparkle. Very simple - but still has personality. 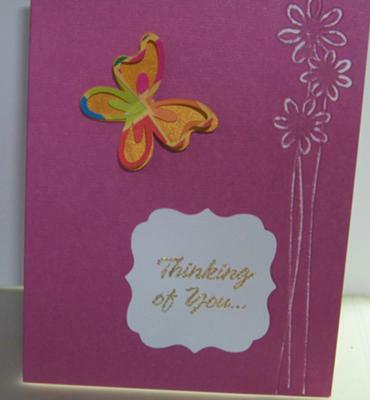 Very pretty card and sometimes a quick "Thinking of You" is all that someone needs to know that you care. The sentiment says it all and the colour of the butterfly makes it stand out from the card. I am sure that the elderly folks you make them for are very pleased with the results.